Voices of War features veterans and their wartime experiences. Stories appear monthly. To suggest ideas for future profiles, call (509) 459-5288 or (800) 789-0029, Ext. 5288, or e-mail warvoices@spokesman.com. Dorothy Tarleton didn’t know she was on the same Pacific island as the atomic bombs that would soon devastate Hiroshima and Nagasaki, ending World War II. As a U.S. Army nurse, 1st Lt. Dorothy Coy, as she was known then, focused on caring for the wounded men brought to the 374th General Hospital on Tinian Island. She bandaged wounds, worked with amputees and watched many men die who’d been evacuated to the hospital from the front lines. To her it was a job – and the details of the war and the battles were not her concern. “Everything on Tinian was so hush-hush,” Tarleton, 86, said last week while sorting through her few remaining pictures of the war at her Coeur d’Alene apartment. One of the photos is of the Enola Gay, the B-29 that dropped the first atomic bomb on Hiroshima in August 1945. Tarleton and the other nurses didn’t know the A-bombs had been brought to the tiny tropical island in the Marianas between Saipan and Guam. And like the rest of the world, they didn’t know until later that the United States bombed Japan. After the famous raids, Tarleton remembers crawling through a B-29’s holding space to sit in the bombardier’s seat. “It was a thrill,” she said. The hospital overlooked the North Airfield, where the B-29s were kept. A 12-foot mesh fence surrounded the hospital – mostly to keep the guys away from the nurses, Tarleton said. She never wanted to be closer to the action and was content that nurses generally didn’t arrive in combat areas until after the land was secured and the fighting had ceased. After the atomic bombs were dropped, Tarleton transferred to Japan’s Kyushu Island and the town of Fukuoka to help set up the 309th General Hospital in a bombed-out insurance building. The nurses often ate lunch from mess kits on a large concrete porch pocked by a gigantic bomb crater. She slept on a cot in the hospital. Most of Tarleton’s war memories center on what she described as the “odd things” that occurred during her service in the Army Nurses Corps, not so much the day-to-day happenings or the fear. Although many of the details have faded with time, some memories are sharp: Tarleton still calls out her dog tag number as if she were lined up for inspection by the commanding officer. “N774015,” she said last week in a strong, official voice. Then she took a deep breath and laughed. Even though she was surrounded by devastation and trauma, Tarleton joyfully reminisced about her service and the adventure it made for the 22-year-old from Chicago who dreamed of being a flight attendant before opting for nursing school. Tarleton doesn’t recall feeling scared. The death and traumatic injuries never bothered Tarleton, who started nurse’s training in 1944 at St. Marys Hospital in Rochester, Minn., which is now part of the Mayo Clinic. As a teenager she had cared for dying relatives. 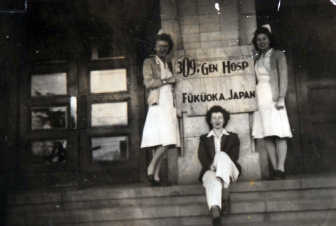 On Tinian, Tarleton said the only time the nurses saw Japanese people was when they left the hospital to hit the beach. The nurses got there by trading the small amount of liquor they were issued to enlisted men for rides. Tarleton said that a few Japanese were living in caves when the Americans arrived on the island and that there were several Japanese camps. Another beach memory causes her to blush. She and the other nurses changed into swimsuits in caves near the shore. She found a different kind of recreation in Fukuoka when some of the enlisted men started a radio station. They picked Tarleton to participate because of her voice. She joined the men on their scavenger hunts through the city for equipment. “We went to a bombed Japanese radio station to pick up whatever they could use to make their own radio station,” she said. Tarleton helped write scripts for the disc jockeys, but her main duty was to bring “class” to the station. That meant reading Robert Burns love poems on the air. The men had heard that’s what American radio stations at home were broadcasting and wanted to imitate the style. Worried that she would goof, Tarleton read under the fictitious name of Mary. She can’t remember her phony last name. Today she wishes she had used her real name so there’d be a record of her short-lived radio career. Also for entertainment, Tarleton and the other nurses would go walking. “Well, I guess you could say flirting,” she said, fluttering her green eyes and shrugging her petite shoulders. It’s not difficult to imagine her as a young woman eyeing Navy men on the docks. The object was to get an invitation to a Navy ship for dinner, where the food was freshly cooked, served on plates and accompanied by napkins. When asked about the contents of the mess kits back at the hospital, Tarleton said jokingly, “Watch ‘M*A*S*H,’ ” referring to the television show. And once, while on a date with an officer, Tarleton was a dinner guest at the home of a Japanese family, who served her dumplings cooked in fish oil. She returned home in 1946 and lived with her parents until she married Jim Tarleton, a Navy officer she cared for at a hospital in Evanston, Ill.
Jim Tarleton became an FBI agent, and the couple moved to Belmont, Calif. They had six children – five daughters and one son. For a time Tarleton worked as a nurse at her children’s private Catholic school. The family moved to Hayden Lake in 1975. “We were looking for places with lakes and a golf course,” she said. Jim Tarleton died in 2001. Dorothy Tarleton turns 87 in April and is proud of her life and family. After moving to Hayden Lake, she and her husband golfed and traveled the world. She visited Japan several times but never returned to Tinian. She painted and volunteered, including working with hospice for two decades. “I’ve done everything I ever wanted to do,” she said.